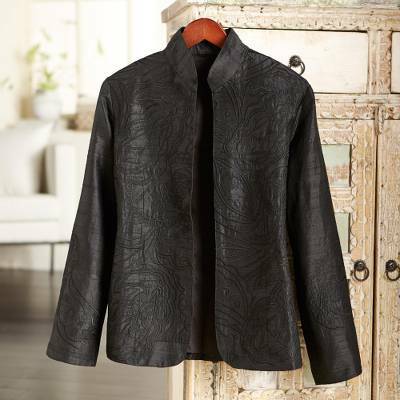 Boteh Embroidered Silk Jacket, "Boteh Garden"
Boteh, mango leaf, even Welsh pear--the pattern most commonly known as paisley in the West goes by many different names. The teardrop-shaped, abstract floral comes in infinite variations, and here they're embroidered on an elegant jacket made of raw silk. The fully-lined jacket features split sleeves that can be folded back. You can find silk jacket 'Boteh Garden' by National Geographic in clothing categories such as Nat Geo Gifts Jackets, Paisley Jackets and Silk Jackets. Enjoy exploring these sections for other Novica treasures. Dry cleaning only. Collar and sleeves can be rolled up. Snug fit, I suggest you size up. Also, overpriced for $147.00. Incredibly perfect for Christmas parties, dinners, etc. but also the same year around for those kinds of events and conferences where you stand out as the speaker. This is a beautiful item, but it was too small. I had to return it. This jacket is so beautiful and well-made. It is a Morher?s Day gift for my mother, and I know she will love it. Thank you! Absolutely gorgeous jacket! The color is vibrant. The workmanship is meticulous. i love this designer's work. Excellent silk products. Loved the jacket, however, it was two sizes too small. I ordered the Paisley Fourish in XXL and it fit perfectly. Unfortunately, I have to return this. Construction lacks tailoring details. Too casual construction compared to the catalog image. No interfacing. Size is much larger than other items of the same size. "Nice fabric but boxy design"
I love silk...this is beautiful fabric. But as others point out the sleeves are boxy and I did have to order one size up. I ordered in merlot. I found the slightly darker color stitching added a nice dimension to the fabric. Unfortunately, the workmanship is a bit lacking. I have a similar jacket that is a much higher quality. Too bad really. I will keep it but have to alter significantly. Overpriced for the quality. The item ordered was shipped just fine and met my expectations. However, I was charged a shipping charge and your catalog indicated the shipping would be waived for purchases exceeding $100. The price for the jacket was $159. What gives?? ?